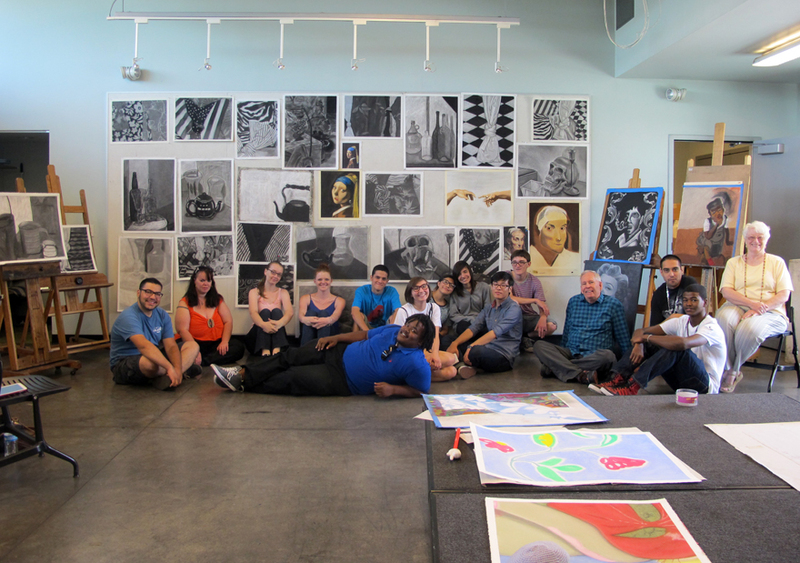 At the start of the semester I ask students what they’d like to get out of my drawing class. Clay says Practice practice practice – and he does. Heather, an engineering student, wants visualization and fun. I hope both were prompted. I ask if she’s enjoyed the semester. Yes, and despite how hard it was, she will miss it. Terry responds TO LEARN TO SEE AGAIN! He came to the right classroom. And from the looks of all of his completed assignments – he did. Most students say they want to improve their drawing skills and in fact, each one of them does. The semester appears to come and go so quickly. We hold final critique this week. The class has two different assignments to go over – maybe more, because advanced students worked through something very different. We get going, and in between there is plenty of laughter, cookies, coffee and peaches. It is an easy ending to a fast paced semester. This particular group moves through the early marker assignments more quickly than any class I’ve taught before. They slow down with charcoal. A few struggle with it in a way I do not expect. Surprises for everyone I guess, including the advanced students who reproduce a master work. For a few days the tension in the room they draw in (because I separate them) was thick. By day 3 there is break through (thank goodness). I spend the last day of class walking from student to student appreciating the focus. I wish I had their very first marker study to compare to this last charcoal. You would get a sense of the progress everyone made. Here are a few highlights – note the values. As usual, I can’t possibly include every work. Adam’s Teapot with reflection of windows and sky in it. Trenary”s glass bottles on tin. Charles works on reproducing an Alice Neel. Have a good summer! Keep drawing, you’ve only just started. We have lots of conversation this semester. We talk about art, looking, seeing, putting down what one sees, and focus. We discuss art as discipline, as practice. Look closely, work carefully. Look closely, draw slowly. Are you drawing what you see? Look. Look. Look again. See. 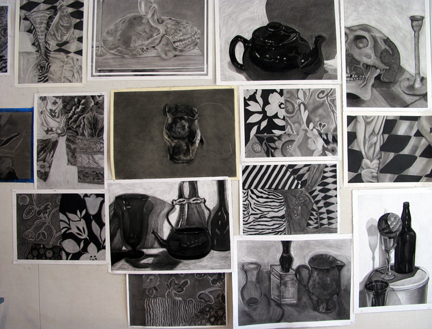 This last critique includes final charcoal studies. The group stays focused with this medium. They work to make the surface of their drawing look smooth and rich. They consider the shape and material of objects, dark darks, light lights, values in between, edges, space and illusion of depth. Have a good break – you all deserve it! 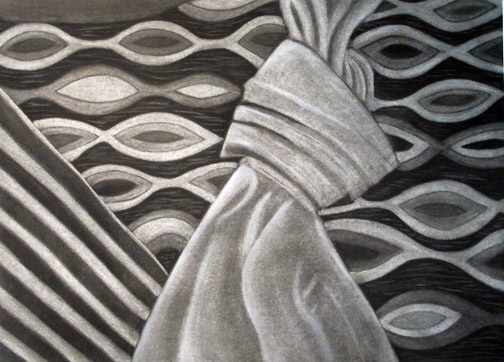 Below is an extra charcoal drawing Susan worked on. Susan doesn’t need any extra credit, she’s got 5 extra credit drawings in the queue – but just in case. Before the final critique begins I watch and listen as students appreciate each other’s work and note their individual progress. Some students remember how nervous they were on the first day of class when I said they would not be using any pencil in my drawing class. It takes a while but finally I get them to organize so we can begin class. It’s been a good semester. This group is full of personality and support for each other. Here are a few highlights from yesterday’s critique. ….. over and out. Keep up the practice! I yell as they exit the studio. When I put this still life together I was deliberate in the fabric and its layout. I combine stiff white cotton, furry faux zebra, mint satin, shiny red and white stripes, matte red and white pin stripes, velvet-black with even blacker glitter circular designs, textured sofa fabric and even a shiny cheep-polyester spider web pattern – maybe the latter is a cruel option or maybe a challenging one for the right person. I let students decide. Anyway…that’s just a few of the complicated patters and surfaces. This is student’s first charcoal composition. It’s intimidating to say the least. By this point the class is wanting to move on to a new medium, so they jump in – head first, to the deep end. I am pleased with progress and result. Most important, so are they. Charcoal is all about working a rich surface, putting down black blacks and lifting out white whites…and working all the values in between. Ana goes right to the spider web and works on it slow and steady for 2 class days. The light hits some spots and a few lines are a bright shiny silver. She notes the highlight with white Conte. She wears her spider web blouse in honor of the work. I am impressed with the patience she’s developed this semester. This is her strong charcoal drawing below. Ashley (below) works almost her entire composition with her one pencil eraser. I make other suggestions but she sticks to her game plane. She’s so focused and appears to enjoy the delicate work, she doesn’t take a break. She finishes and decides to use white Conte for the zebra patterned white’s she’d already completed. I wish I’d caught her before she’d gone in that direction. We talk a little about why I think she should have kept her original carefully developed whites. After-all her erased marks were so rich and sensitive. She tones it all down using her finger tips and eraser, and pulls it together beautifully. Lela (above ) notes very quickly why I ask them to use soft compressed charcoal. And why I suggest they be careful with the white Conte. She re-works the striped area many times until she is completely satisfied. I let her borrow my somewhat pricey, white soft-pastel. 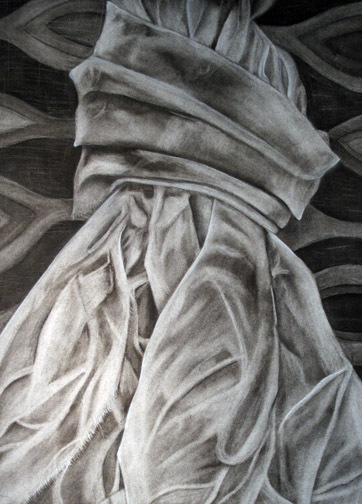 The folds in the cloth are accurate, – consequently believable. Tanya (below) never relaxed with the marker, though she’s calm and happy with charcoal. I comment on how her whole body appears at ease as she develops a beautiful and dimensional knot. She finishes the composition with some complex pattern on either side of that knot. She expresses her emotions with humor, in the title. Finally Adriana, above, who began the assignment so nervous she said she felt like someone who had never even picked up a pencil. And then she completed this incredible knot. I think her confidence is back. Manny (below), one of my Drawing 2 students, kicks up dust with color pastels. I tell him to be careful. He shouldn’t be inhaling pigments. He works by the open front door and direct the dust out of the classroom. I’m amused by how he draws, its physical for him. He has taken two semesters with me. His whole style has developed. I want him to continue in the fine arts, but Manny will do what is best for him. He’s now a graphic design student. He freely helps the other students who are struggling with the various challenges of working with charcoal and Conti. I listen and watch the way he supports others and their work. They take to him well. I also think he could teach. I let them go an extra day even though we don’t have very much time left in the semester, because as a whole, the group is working the materials so well The surfaces are rich and well-developed, not bad for their first charcoal assignment.